Ashley Roll has put together a really nice little unit here. Leave off the MAX232 and keep these handy for the few times you need true RS232! Plugs into any 0.1" header to connect to your circuit. Perfect for the BASIC Stamp or other microcontroller appications. Brady Palmquist says: "James...got your RS232/TTL cable today. FAST! And it looks great. Will work great for programming radios. Thanks VERY much." The RLC units can allow you to talk to a wide range of devices, to adjust, fix, or re-program them. Monitor ECS Erik Hanson reports that with a little modification, the RLC-1 can be made into an ECS port converter cable for data sent by the Sony DAS (Digital Alignment Software) to control all aspects of the operation of the monitor. 5. Blue RTS unused, may need to be shorted to CTS depending on your PC and the software used. 6. Green CTS unused, may need to be shorted to RTS depending on your PC and the software used. We now have an ECS specific version of the RLC1 (called the RLC2) which had the correct pinout for a SONY monitor. It's the same other than that; if we are out of stock on RLC1's and you are in a hurry, order an RLC2 and swap pins 1 and 2. QNAP TS-409 NAS http://www.cyrius.com/debian/orion/qnap/ts-409/serial.html documents the connector pinout as follows from left to right looking from outside toward the center of the board: GND, RX (TX from RLC1), VCC, TX (RX to RLC1). The connector supplied with the RLC1 must be replaced with a JST PHR-4^ connector. RouterStation OpenWRT http://www.ubnt.com/wiki/RouterStation_OpenWRT_SW_Setup_Guide#Connecting_to_RouterStation J3 is pin1 - 3.3V, pin2 - S_IN (RX), pin5 - S_OUT (TX), pin6 - GND, so the RLC-1 connector would need to be re-arranged to that pinout. http://sites.google.com/site/seagatefix/Home for detailed instructions. The converter he uses is no longer available (last we checked) but the RLC does nicely intead. The RLC-1 RS232 to 3-Volt or 5-Volt (CMOS/TTL) Level converter provides a simple, low-cost and easy to use solution to interfacing a CMOS or TTL based circuit to an RS232/EIA232 serial port. The RLC-1 contains an internal circuit to provide the positive and negative voltages needed for true RS232/EIA232 compatibility and to convert these voltages back to logic levels. It is particularly suited to micro-controller applications; for instance the PIC or ATMEL families of devices and products using these. The RLC-1 is built into a small DB9 backshell with about a foot long (12" or 32cm) lead terminating in a standard 0.1" (2.54mm) Molex KK-series 6 pin connector. The connector is used to provide power to the converter and deliver the Serial data signals to the attached circuit. Its small size and convenience make it ideal for prototype or one-off systems, eliminating the need to design and debug extra level shifting circuits. It is also useful for circuits that need periodic connection to a host like dataloggers where a single converter can be used with many products, reducing the parts count and therefore cost for the individual units. 1 WHT Vcc Power supply to the RLC-1. 3 to 5 Volts. 2 BLK Gnd Ground Connection (0V). 3 YEL Data Out (TX) Data sent from the logic level device to the RS232 device. 4 RED Data In (RX) Data sent from the RS232 device to the logic level device. 5 BLU RTS Request to Send signal sent from the RS232 device to the logic level device to indicate it wishes to transmit data. This signal is Active Low. 6 GRN CTS Clear to Send signal sent from the logic level device to the RS232 device indicating that it can begin sending data. This signal is Active Low. The logic level (CMOS and TTL compatible) interface is a Molex KK Series, locking and polarised 6 pin crimp terminal housing. 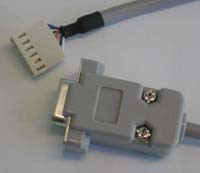 A compatible header for these connectors should be available from most electronics stores, alternatively a 0.1" (2.54mm) universal header could be used. Note that the logic level interface is not isolated from the RS232 level interface and they share a common Ground. The RLC-1 is build into a DB9 Backshell and comes with a female DB9 connector. 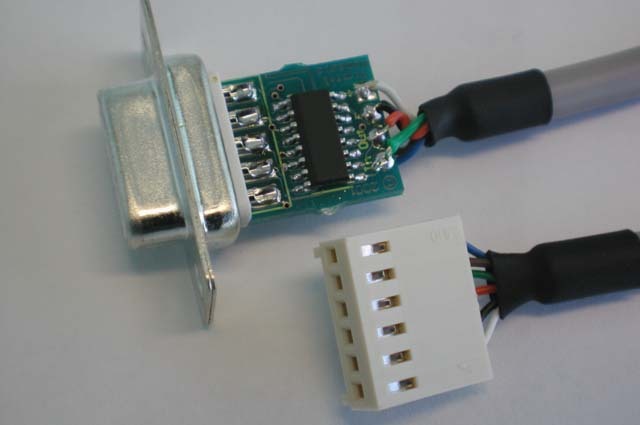 The DB9 RS232 connector is wire as a standard "Null Modem"; DTR, DSR and CD are permanently wired together but the RTS and CTS signals are provided to the 5-Volt interface and must be connected together if not used in the attached circuit. Vcc = 5V +/-10%, TA = -40 to 85 Deg C, unless otherwise specified. Typical Values are referred to TA = 25 Deg C.
Absolute Maximum Ratings are those values beyond which damage to the device may occur. Functional operation under these conditions is not to be implied. Digital Nemesis Pty Ltd makes a single standard unit, but is able to adapt them as needed. Note that a minimum order quantity will apply for non-standard configurations. For more information, please contact salesspam at digitalnemesis.com. © Digital Nemesis Pty Ltd, 2001. Arthur asks: "Does the RLC invert the Pin-3 data out signal?" James Newton answers: "Yes, the signal is inverted in terms of electrical polarity. e.g. a TTL low will generate a positive voltage on the TX output pin, a TTL high will generate a negative TX. But the other possible correct answer is No, the signal is not inverted in terms of logic. In the RS232 standard, a low electrical level (3 to 15 volts) is defined as a logic 1, or 'on' or 'high' and is referred to as 'marking.' So a TTL high which is a positive voltage, will generate an RS232 "high" which is a negative voltage. "On the page http://www.piclist.com/techref/io/serial/RCL1.htm, it starts with "RCL" and becomes "RLC" throughout the rest of description. Yep, I know: Picky, Picky, Picky!!! Thanks for an interesting and useful site." +James Newton answers: "Oops." http://eq-mod.sourceforge.net/eqdirect.htm How to use an RS232 to TTL adapter to connect to an EQ6/EQG/Atlas telescope mount. http://www.awce.com/rs1.htm Kit with larger components. Does not include a cable. 5 Volt operation only. As of 2006/08/03 the cost was $10 for the PCB only, $14 for the kit and $26 A&T. If you don't mind the size and want to save $5 in return for building the kit, this is a good option. http://www.dontronics-shop.com/RLC-1-RS232-to-5-Volt-Level-converter-p-16186.html Another source for the RLC-1. As of 2008/02/05 the price is $26 USD. It may be a better option for people ordering outside the USA depending on the shipping. http://www.embedinc.com/products/ser Larger, no case, no cable, does not convert RTS or DTS, does not support 3.3v. Ss of 2008/02/05 the price is one dollar less up to qty 4, but the 5 unit price is $13.80 which is quite good. CoolMCU Converter Cable. Physically larger than the RLC-1. Used to sell a version that was not a true MAX232, but the current version seems like a good product. From Canada, so expect shipping and customs delays. Priced at $16 plus $11 express shipping to US (5 to 7 business days advertised) for a total price of $27. Compare with our $21 + $6 for 2-4 day Priority Mail shipping. The price is the same, the shipping is faster. Read the ebay comments: Many times shipping is fast, but you may be the one that gets held up in customs. "Product works great, but it took over three weeks for me to receive it (USA)." kielziz( 5 ) Jun-01-06 08:21 "Works as described. Shipping is a little slow." asylumboy( 4 ) Jun-01-06 08:10 and so on. In the end, the same thing costs less in Canada, but more to ship to the USA. I have offered to resell this product in the USA, but he is apparently not interested. http://www.ipenabled.com/ttl-rs232.html Almost $100 with power supply and shipping. http://www.superdroidrobots.com/shop/category.asp?catid=41 $10 more but has a longer cable. I personally would not think that a TTL signal would be reliable at higher speeds over a cable that long.